Real-time strategy has had a checkered history on consoles, leading most developers to either focus exclusively on console interfaces or retrofit a console version after severe tweaking. 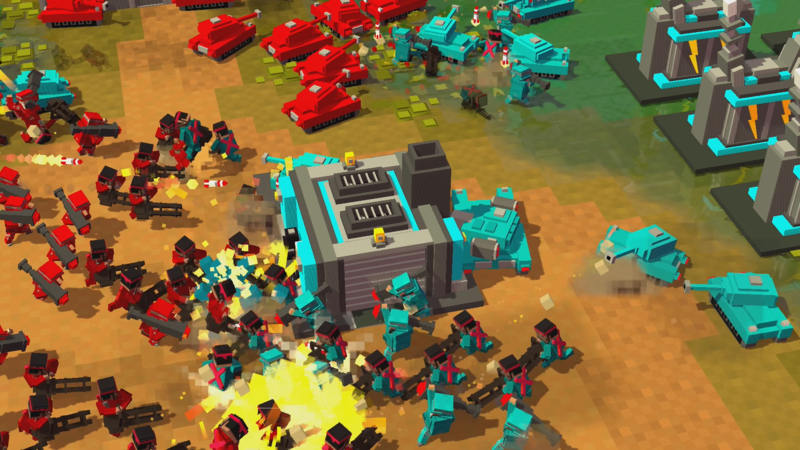 8-Bit Armies, an indie game in the vein of Command & Conquer and StarCraft, is a valiant attempt to recapture the magic. It prides itself as a retro-style strategy game, and it is certainly that, even to the point of feeling a little too familiar. Aside from some smart tweaks and revisions, it doesn’t offer much new to the genre. Those familiar with the classic strategy archetype set by StarCraft will have some idea of what 8-Bit Armies has to offer. You begin with a Headquarters, supplement with a resource-gathering operation, and then begin to build up your Barracks, Machine Shop, and other related wartime buildings to create your armies and lay waste to the enemy. Within that framework, though, 8-Bit Armies has slimmed down some of the complexity that may have made the other strategy games it apes too daunting or unmanageable. There is only one resource to gather rather than two, and buildings themselves fulfill unit prerequisites without individual research goals needed. The result is a zippier version of a very familiar formula, in which a respectable army can get up and running within a few minutes, rather than a half-hour or so before the real hostilities begin. Other than those minor adjustments, however, 8-Bit Armies suffers from having been there and done that. Its hook is a blocky voxel art style akin to Minecraft, and it is charming to a point. However, the camera is pulled back too far to appreciate most of the angular unit types most of the time, so it doesn’t pack as much punch as it could have. In fact, the distant camera is just one way the game feels poorly optimized for the PlayStation 4. Tooltips and unit information is virtually unreadable when sitting at a generally comfortable distance from the television, a clear sign that this was meant for a monitor. The unit build menu is mapped to the analog sticks, but it’s slightly fiddly and sometimes difficult to make a selection in the heat of battle. The build menu does have one standout feature, though. Since units are selected using the analog stick, pressing one of the three face buttons (X, Triangle, or Square) activates both their build and selection from then on. Essentially this means you can plan your hotkeys for unit selection as you’re building them in the first place. If you know you want each of your three buttons to correspond to five machine gunners, five tanks, and five rocket units, you can arrange them that way to start with. It’s a very small change in unit efficiency, and difficult to get a hang of, but it’s a smart one. Armed with some decent new ideas mapped onto a familiar and beloved genre archetype, 8-Bit Armies could have been something special. It’s unfortunate, then, that the campaign is generally a dull and overly long exercise. This has long been the bane of genres that are best suited to multiplayer, since a single-player experience is never as dynamic. This game doesn’t avoid that particular pitfall, and in fact exacerbates it by overstaying its welcome with missions that blend together. The strength should be in multiplayer, against other human opponents who can offer a layer of strategy and second-guessing each other that bots simply cannot. However, in my experience it can be difficult to find a match on PlayStation 4, which likely speaks to a relatively small audience on the platform. At its core, 8-Bit Armies is a an imitator. A competent one, a throwback, with a few clever tricks of its own, but nothing wholly original or revolutionary. If you’re itching for another strategy game it will satisfy well enough, but it doesn’t feel essential. 8-Bit Armies review code provided by publisher. For more information on scoring please see our Review Policy here.